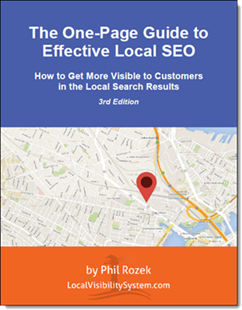 Good can come out of bad, you’re totally right – diversify to mitigate the Google+ Local effect! ‘Other stuff’ is essential, even if Google+ Local were responsible for 100% of new customer referrals business owners shouldn’t go all-in with any one vector. Profound badassery! Nice yin to Mike’s yang. Thanks for weighing in, Chris! By far the most important, I believe. Thanks for the insight Phil! Good call. Yeah, I didn’t organize the list in order of importance (probably should’ve, though). I’m with you, though: to me, email is the most important, with the website itself coming in a close 2nd. Again, I can say from first-hand experience that you can get the phone to ring by having good, helpful emails even if your site is blah. But even a great site that forces people either to “buy now!” or to leave and probably never return is a missed opportunity for everyone; email lets people stay in touch without being forced to make a choice. As you’ve pointed out a number of times, beefing up the content of your website with good information is a great way to boost traffic from ALL search engines.- and provides potential members of your email list. It also gives people a reason to link to your site. If you’re going to create information/articles/posts of your own, then Google Authorship should be on the agenda. You may as well build credibility in your field, because the higher your rating as an Author, the higher your ranking will be for the posts or articles that comprise your content. While you’re on the job of building your credibility, guest blogger gigs, or a regular trickle of posts in relevant blogs and forums will help things along. Great additions. I couldn’t agree more that getting your name “out there” – both for the eyes of Google and the eyes of readers / potential customers – is huge. Great post Phil, as usual. I try not to be a “sky is falling ” kind of guy so my take on Mike’s excellent post and some insightful comments there was this is hilarious. Google is either totally inept or this entire scenario is a carefully orchestrated scheme. As you alluded to here, trying to manage things you can’t control is a waste of time. My advice to clients, and I sometimes take my own advice, is to focus on as much low hanging fruit as possible. Just pick the stuff off the ground in the Google orchard and move on to some of those other plantations where they give you free access to some pretty tasty treats. In your lifetime you will never exhaust the supply of useful assets and resources not named Google. Thanks for the list Phil. I love the way you invoke scenes and imagery to make a point. Can you pick the answer to a question I’ve been wrestling with? This afternoon I want to do one of four things. Which is easiest? Thanks a bunch for your thoughts, Chris. True stuff.